A NEW Solar Eclipes is born! positive and safe ascension into 2012 - the Shift of the Ages. A new solar eclipse will be created on July 1, 2011. This is a rare occurrence and a most auspicious date for us to co-create a unified field of cosmic consciousness that will propel the shift of the ages. This eclipse speaks of creation for it is a cosmic event produced by Source. The event, the effects of which will be experienced throughout our lifetime and beyond, will succeed for future generations until the year 3237. Click here to read more about the NEW Solar Eclipse of 2011. What a blessing we have at this time to co-create the Shift of the Ages….. Sing from your Heart: BeeLove, BeeLoved & Bee Love! Peace, Unity, Love, Light, Freedom, Health, Joy and Ascension for All Life! For our One Heart Visualization please watch this video. Jose shares how we can prove that human beings can do something great by synchronizing in a positive telepathic unified vision the “Circumpolar Rainbow Bridge” around the Earth for a healing of our Hearts, of Earth and of our Lives producing instant Spiritual Evolution. 2011, the year to Bee Unity Consciousness and give birth to the Golden Age of Aquarius will happen on July 1, 2011 at 7:53 am GMT at the South Pole of the Earth when a new Solar Eclipse is born. At this time we are co-creating a new unified consciousness and a new reality. Therefore, it is important to be mindful of all our thoughts and actions for the outcome of this global event will impact every person on the planet. This is a clarion call for all sentient beings to come into the resonance of the sacred heart. When we do this we create a unified field for world peace and for a new paradigm, our universal destiny, based on love and equality. On this new Solar eclipse the Sun and Moon will be aligned to Sirius, the brightest and closest stargate in our sky. It has always been an important guiding star helping to navigate on the Earth and in the Heavens. The ancient Egyptians and other civilizations have honored Sirius as Isis, bringer of Light and Life. Sirius is the home to many ascended masters, star beings, dolphins and whales assisting in humanity’s evolution. We have just witnessed the changes happening in the world which began this year in Egypt, the cradle of ancient civilization. The effect of the uprising brought people together to claim their human rights, demand freedom and a fair government that will create supportive systems for its people. This has had a ripple effect throughout the world thanks to the internet and has helped us communicate instantly and know the reality of our global world community. 2011 is an unusual year for eclipse cycles. This year there will be four Solar eclipses and this is twice as many eclipse cycles as in most years. Solar eclipses are the most potent of the new moon energy. At the time of the Solar eclipse the Sun and Moon come together, they “hide” and take something away that is no longer needed. Thus Sun and Moon cast their shadow on the Earth, while they unite to create something new. Solar and Lunar eclipses are based on the geometrical dance of the Sun, Moon and Earth. An eclipse brings the hidden shadow into light. This creates a portal that is critical for our evolution, the effect of which is long lasting, catalytic and global. The moon must be near one of the lunar nodes, the spots on the zodiac where the Moon’s orbit crosses the earth’s orbit. When an eclipse is first created it happens at either the North Pole or South Pole of the Earth. A Lunar eclipse occurs when the full moon passes behind the Earth blocking the Sun’s rays. The Solar eclipse occurs when the new moon passes between the Earth and the Sun casting a shadow on the Earth’s surface. At the time of an eclipse a consciousness is born with a story line or theme based on what is happening in the collective consciousness at that moment. On July 1, 2011 at 7:53 am GMT the new solar eclipse will be born, evolve and grow for 1226.05 years. Click here to read James Twyman's Prayer for Peace. When I heard about the disappearance of the honeybees, I prayed for many days and was awakened at sunrise one morning with a message from Our Earth Mother. Since April 2007, there has been much media about the flight/plight of the bees. I believe that the bees are awakening in us the need to take action. Bees are the symbol of Friendship, Sweetness & the Life of the Goddess. Honeybees are the oldest social insects. They are a gift to the Earth from the planet Venus have been buzzily creating and pollinating plants for our food source and bringing beauty and honey to us for over 30 million years. Over 50% of the Honeybee population has died. They are now on the endangered species list. We must do something now. Now is a critical time on our Beloved and Beautiful Planet Earth. We are being asked to come together to activate the Flower of Life repairing the 12 strand DNA and to birth a new frequency and paradigm, which supports a healthy life-sustaining world based on health, harmony, integrity, freedom, peace, love and plenty for all. There is all the knowledge, the means and the technologies to create this Heaven on Earth right now. It is our birthright. We Must Invoke this! We ask for your prayers of Love and Appreciation now. "The consciousness of a beehive, not the individual bees, is of a very high nature. Humankind will not obtain the wisdom of such consciousness until the major revolutionary stage - that of Venus - which will come when the evolution of the earth stage is finished. The human beings will possess the consciousness to construct things with a material they create themselves." We are at this Ascension time right Now! May all hear the sacred Om of the Infinite Universe. In England the Bee Here Now ceremony will be held at Avebury stone circle. If you'd like to participate meet at Avebury's Red Lion Pub at 11:11am. Please join in unity, love, song, dance, prayer and appreciation for the life and gifts of our Earth Mother and her devoted honeybees, who work continuously pollinating over 60% of our food source and creating beauty and honey, as they teach us how to work together and live in balance, unity and harmony. We can Bee the change we wish to see. The urgent hum of the many dying honeybees needs to be heard. The honeybees are communicating to us that we are out of balance with nature. It is crucial that the killing, poisoning and abuse of Mother Earth’s food source, her children and natural resources stop now!With our positive prayers, focus, intention, action and love for our Earth Mother and the honeybees, we can begin now to assist. They do hear us and they do respond. Thank You and Blessed Bee to You All! I would like to introduce you to Maka, who is a remarkable and dedicated shamanic filmmaker, who was a beekeeper for 13 years in Saskatchewan, Canada. Maka’s current passion and mission is to educate and inform the world by being a spokesperson and emissary for the honeybee’s message. She is creating a beautiful documentary called “The Honeybees of 2012” An experiential video she created during the research phase of her project can be seen by going to her website: www.thebeegoddess.com. Please support her in any way you can to connect with “meant to Bee” professional collaborators and to get the necessary funding to complete this important, vital and timely film. The June 12, 2010 date for the ceremony came to me after being guided to be in Egypt's great pyramid for 9-9-9. A couple days later in Luxor, just upon waking from dream time, the symbol key of Chiron, the wounded transformational healer and planet appeared with the message “June 2010 is the date for the Rebirth of the Earth.” Then came the image of the honeybee, which was a symbol for ancient Egypt and of the lineage of the Magdalene. The loving, benevolent and joyful face of Hathor then came. The Hathors are fifth dimensional light beings who incarnated in ancient Egypt through the cult of the Goddess Hathor. The Hathors and the honeybee came from Venus to Earth bring sacred sound and the vibrational frequency of Love and Beauty.In a fiery red flash Sekhmet, the Lioness Goddess appeared. She who is known as the “Mighty and Powerful One.” Her compassion could be felt, however, her roar was fierce when she expressed that greed, poverty and war must end now. Sekhmet reminds us that Love is our greatest power. We are the Spiritual Warriors and are here with the support of the Archangels and their Angelic Legions to bring Light and Love to Earth. When I looked at the horoscope for the new moon on June 12, 2010.I understood more about the urgent message as the planetary alignments demand positive action. We are being asked to be of service to assist in this amazing time, the ï¿½Shift of the Agesï¿½. Click to read about the astrology of this time. This is the slideshow starting with a seed group of 24 who gathered in Stonehenge sunrise Sept 20, 2007 to bring the energy for the Autumn Equinox down the ley line to Avebury Stone Circle 18.6 miles away, segueing into the Autumn Equinox September 23rd, 2007 ceremony at the northern circle of Avebury. Between 60-70 people attended. 888 is the astrological activation time to open the new 5th Dimensional Spiritual Paradigm and will create a worldwide harmonic energy wave for personal and planetary ascension. Our magical teachers, the Honeybees, gift to Earth from the Planet Venus, move in a figure eight, Infinity dance and remind us of the importance of continuing the eternal wave of balance and harmony staying in the flow with the feed-back loop of creation. The figure 8 dance of the Honeybee called the waggle dance is how the bees communicate to hive-mates information about the direction and distance to patches of flowers yielding pollen, water sources and when bees are selecting a new home site. Bees survival is dependent on mutual cooperation and division of labor. 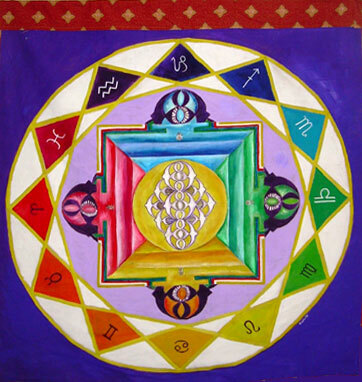 Click to read about the Numerology of 8. Click to The 1999 Solar eclipse, symbol and message for it is connected to this 888 activation and can be used again as the key that now needs another turning to activate this ascension. 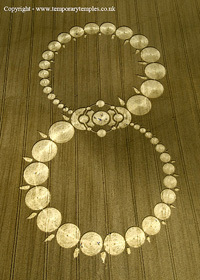 This magnificent figure 8 crop circle appeared at sunrise 888 on Milk Hill nr. Honey Street, which is very close to Avebury stone circle. In June, 2004 the ï¿½beeï¿½ crop circle formation appeared at this same location!This was the sign and message we were waiting for. It heralded the time of the great shift happening and the confirmation that the scales have now been tipped in the positive direction of light, life & love and that milk and honey will flow once again.The figure 8 is the movement that the honeybees make, called the ï¿½waggle danceï¿½ to communicate to hive mates where the source of nectar, water and where the best place for a hive will be. On this auspicious sunrise 888 the honeybees were communicating that there is hope and that the bees, as well as humanity will survive, as long as we are sensitive to the signs and messages given to us. Through the crop circles, which are messages from earth herself, from nature, from super-nature, and interdimensional, as well as extra -terrestial beings. The crop circles are a gift to us as codes, messages and activations. Just a few months after 888, on November 4, 2008, we witnessed the miraculous election of Barack Obama as the 44th president of the United States of America. He embodies the aquarian ideal. And is a symbol of the healing nations and of the separation of black and white, christian and muslim.This is a time for gratitude and celebration. The old structures are and must crumble. We have to ride the wave of change, go with the flow, stay in faith, hope and trust, and know that the new paradigm of unity, integrity and love is being born now. 888 Bee Here Now Ceremony in Avebury. In the UK please join us in Avebury in front of the Red Lion Pub at 10am. IT IS ASCENSION TIME ON OUR BEELOVED PLANET GODDESS EARTH! 22 July is Mary Magdaleneï¿½s feast day, when the sun is on the cusp of the sign of the moon - Cancer and the sign of the sun - Leo. This July 22 , 2009 date is extra special, numerologically, as well as,ï¿½ being the day of a total solar eclipse. This solar eclipse will be the longest solar eclipseï¿½ experienced in the 21st century!ï¿½click here to read more on the Total Solar Eclipse. The numerology of July = 7 + 22 = 11 and 2009 = 11 together 11 + 11 equals the master builder number 22.ï¿½ Thisï¿½activates the 11:11:22 gateway which opensï¿½ aï¿½ portal into an interdimensional time shift.ï¿½ We are beeing given the opportunity to stepï¿½ into , awaken and manifestï¿½ our multi-dimensionality, as enlightened spiritual beeings on earth to bring in the Aquarian age and a new paradigm, frequency and template for life on earth. The bright and beautiful planet Venus is the elder sister to Earth. The honeybees were a gift to Earth from Venus many millions of years ago and have been showing us how to live in community and how to create beauty.ï¿½ Venus is the morning star during 2009 and is guidingï¿½us on the royal path of love,ï¿½ through the heart. Beeing in the heart and coming from love, gratitude, forgiveness and compassion is what is necessary for us all. We and our Planet Goddess Earthï¿½ are now in the time of choice, we are all beeing given the opportunity to move upward in consciousness. It is the time of ascension now!Tom Kenyon is a channel for the Hathors, inter-dimensional beings and masters of love and sound. They are assisting us by sharing important information, useful tools, meditations and vibrational energy and sound to help us in the ascension process. Learn the holons for ascension. Visit his website to learn moreï¿½ www.tomkenyon.com .Tom Kenyon and the Hathors asked for a global holon of ascension on April 5, 2009. 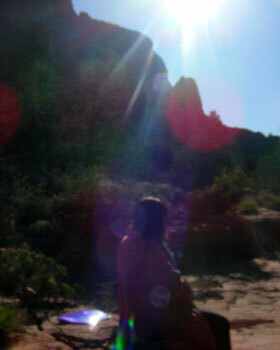 Check out the colorful orbs taken by Annmarie Touchette of Elizabeth Heartstar while doing the holon of ascension at Bell Rock Vortex in Sedona, Arizona. I would love to hear from anyone else who has something to share and about locations for linking up for this 11:11 gateway. Please email me at elizabeth@astrojourneys.com or call me on my mobile number at 07794676206.